Mauricio Pochettino was delighted with the character shown by his Tottenham players as they claimed a 1-0 Premier League win over Burnley. 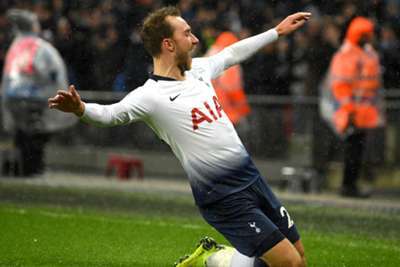 Christian Eriksen struck the only goal of the game in second-half injury time to secure all three points for the home side in heavy rain at Wembley. The result, just four days on from the 1-1 draw with Barcelona that sent Spurs into the last 16 of the Champions League, means they remain five points behind Premier League leaders Manchester City. Pochettino was thrilled with the victory after watching his players frustrated for long spells by a Burnley team who restricted their opponents to three efforts on target. "The character to always push to the end shows great belief and faith in the way we play. That pleases me the most," he told BBC Sport. "You can win or lose but to try and play the way we are playing it is always possible to achieve what you want. "I think it was three centre-backs for the first time under Sean Dyche, but we didn't concede a shot on target. We dominated possession. They put a lot of players behind the ball and played deep and wanted to stop us. "On an afternoon like today, with the rain and the pitch not in best condition, we were not fresh enough to find tempo with the ball, so it is difficult to play and I think that is why I am so pleased." Pochettino also praised full Premier League debutant Oliver Skipp, who impressed in the middle of midfield in tricky conditions. "I am happy because it is not easy to play every three days. Many players are out," Pochettino said. "Oliver Skipp made his debut. It is fantastic because to keep going in difficult circumstances pleases me and the way we are competing this season pleases me." Burnley boss Dyche was eager to focus on the positives, despite the frustration of conceding a goal that started from a relatively simple long ball. "Obviously, we are frustrated and disappointed in the outcome but [there are] a lot of positives," he said. "We know it is tough coming to these places. My only gripe is we get done by a whack down the pitch. "I am pleased they have resorted to that and we made them play longer. Inevitably, we didn't deal with that final moment and they nick a goal. "There is a resilience and organisation, but we are playing a top side. It is difficult to come down here."